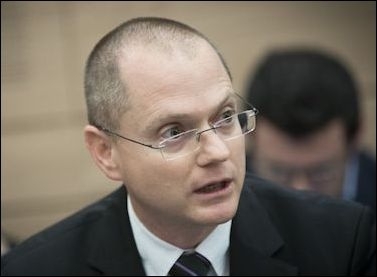 MK Oded Forer is co-chairman of the Knesset Israel Victory Caucus, a project initiated by the Middle East Forum. MK Forer briefed the Forum in a conference call on October 30, 2017. Please note: The Forum will be hosting a Knesset delegation in New York City and Washington during the week of November 13. Ze'ev Jabotinsky, author, soldier, and Zionist leader, introduced his Iron Wall doctrine in a 1923 essay, which maintained that Arab acquiescence in the Jewish right to statehood would only follow upon the establishment of an unassailable Jewish power base - military, political, and diplomatic. This logic informs today's Israel Victory Project, namely that only a decisive Israeli victory will drive the Palestinians to accept Israel as the state of the Jewish People, with Jerusalem as its capital, as the realization of the Jews' historic right to national revival in their ancestral homeland. The reentry of the Iron Wall doctrine into the Israeli political discourse is a corollary of the collapse of the Oslo process, which enabled Yasser Arafat to win Israeli concessions while sustaining his violent drive for Israel's destruction in line with the PLO's 1974 Phased Strategy. The reentry of the Iron Wall doctrine into Israeli discourse is a corollary of the collapse of the Oslo process. Mahmoud Abbas, Arafat's successor, has fully followed this rejectionist stance, dismissing the idea of Jewish statehood, sustaining the Palestinian Authority's virulent anti-Semitic and anti-Israeli incitement, and paying families of Palestinian terrorists in Israeli jails. This proves beyond shadow of a doubt that the lingering Palestinian-Israeli conflict has nothing to do with such practical questions as border delimitation and the future of Jewish neighborhoods in the West Bank, but with the relentless Palestinian rejection of the Jewish right to national self-determination. The validity of the Iron Wall doctrine has been proven time and again in modern international conflicts. Post-WWII European peace and prosperity has been established upon the destruction of the Nazi drive for mastery. Israeli MK Oded Forer, co-chair of the Knesset Israel Victory Caucus. The 1979 Egyptian-Israeli peace treaty was concluded upon Anwar Sadat's realization of the Arabs' inability to destroy Israel by force of arms. The peace agreement between FARC and the Columbian government was achieved after the underground organization had been comprehensively defeated. This in turn means that an Israeli-Palestinian peace agreement can only be reached when the Palestinian leadership reconciles itself to the futility of armed force and tells its people, in Arabic and without equivocation, that it eschews violence and recognizes Israel as the state of the Jewish people. This tacit acknowledgement of defeat is likely to spur the Arab states, many of which have tired of the futile conflict with Israel and have come to appreciate Israel's massive contribution to their fight against their deadliest enemies - the hegemonic ambitions of both Iran and Islamist terrorism –into making their peace with Israel. Related Topics: Arab-Israel conflict & diplomacy, Arab-Israeli debate in the U.S., Israel & Zionism | Oded Forer receive the latest by email: subscribe to the free mef mailing list This text may be reposted or forwarded so long as it is presented as an integral whole with complete and accurate information provided about its author, date, place of publication, and original URL.